Global Day of Action Peace Rally in association with IQ presented on the 2nd anniversary of the illegal Iraq Invasion a substantial crowd gathered in Peace Park, Byron Bay. 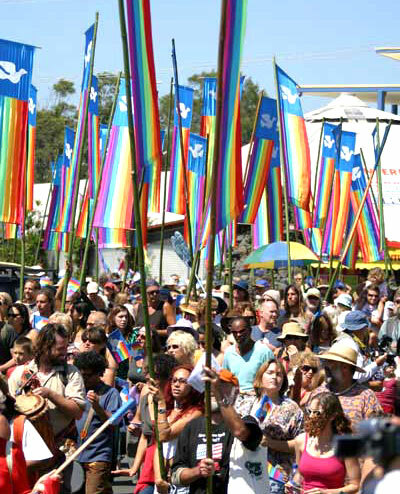 Noteable proceedings included; Aboriginal fire ceremony & prayer; Peace Walk around town featuring satin rainbow peace flags; Talks at the surf club after the Peace Walk; Speakers – Mayor Jan Barham, Cr Tom Tabart, Helena Norberg-Hodge, Danielle, Nyck Jeanes, Gareth Smith, Seedsavers, Kali Wendorf, Marcia Harris; Concert featuring reggae band, Cloud 9, Gangagiri and BlissMongers; Documentary “Outfoxed”, about the Murdoch war on journalism; Movie about depleted uranium and Into the Heart of Iraq. Also featured African dance, contemporary dance, Middle Eastern dance and Indonesian dance performances. A Peace Expo showcased the efforts of groups like Greenpeace, Oxfam, Seedsavers, Friends of the ABC, No Landmines, Amnesty and local environment groups. The Peace work continues at www.byronpeacecarnival.com. Visit to print off some ‘Make Peace not War’ posters and spread the word.